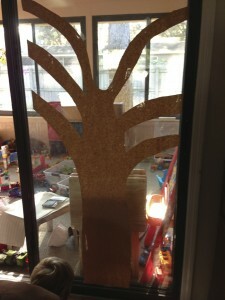 I had saw on pinterest a cute thankful tree where the kids write down what they are thankful for every day and put it on a cut out piece of paper shaped like a hand and those are the leaves of the tree. I wanted to try it this year. 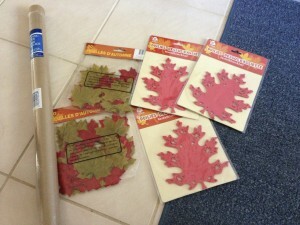 I had a friend tell me that the dollar tree had leaf shape doilies that were red. So instead of cutting each one out by hand I just spent a buck for about 30 of them and I will just tape them to our tree every day. Here is what I bought at the dollar store for our tree. a package of brown wrapping paper for the tree trunk, 2 packages of decorative leaves and 3 packages of doilies. Of course you need tape as well. 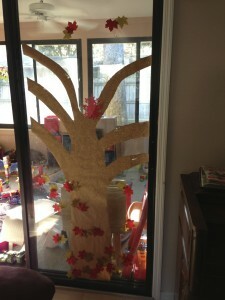 I carefully traced (I am NO artist) the trunk and cut it out to look sort of like a tree and then taped it to our sliding glass door in our living room. You can put it wherever it will work for you. I saw one on a refrigerator too. 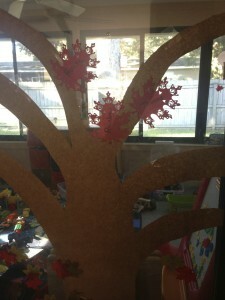 We decorated it with some of the leaves and and it is ready for us to add all of our big red leaves on Thursday! We actually started today since they were so excited about it and I was taking pictures! 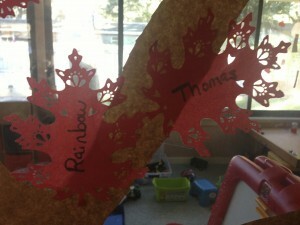 I will have each boy tell me one thing they are thankful for each day and we will add it. Even if they repeat of tell me something silly it is still them being thankful for even the small things in their lives. There are other ways you can do this too. 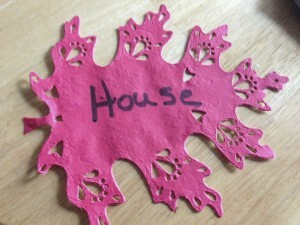 Get some pieces of paper and make a long chain and set up your Christmas tree and decorate it for fall. Or you could hang the chain in a room to decorate and add to it every day. 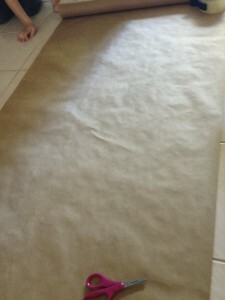 Or do a mini version of it instead of something big and put it on a smaller wall or window. Get a table cloth at the dollar store and put it on your table and write on it every day what you are thankful for. What ways are you being thankful for this year? Remember we should be thankful every day not just in November! T Thess 5:18 Give thanks in all circumstances for this is God’s will for you in Christ Jesus.